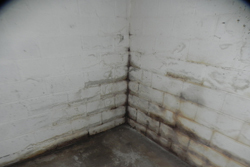 A wet basement can be caused by a lot of different factors, but the end result is always the same: a moldy, musty basement with spreading water damage. While your home was definitely built to withstand water seepage and leakage, over time your moisture barrier may have broken down and failed. In some cases, your wet basement may only occur during rain or snow which may make it seem like a temporary or low priority problem. This isn't the case - if your basement shows signs of moisture, dampness, trickling, leaking or pooling, you need to get the problem taken care of right away. We are wet basement contractors. A wet basement doesn't just mean it's inconvenient to store stuff down there or unpleasant to be in the room, it means that moisture is seeping into your house and causing more and more water damage every day. Water damage is a cumulative process, meaning that the longer you wait to repair it, the more serious damage it causes. You may not see it until it's too late, either. 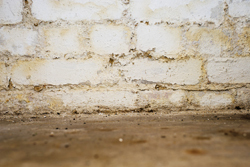 In addition to ruining storage space, your wet basement could lead to drywall crumbling, swollen or rotten joists, mold and mildew that are bad for your health, and much, much more. There's no reason to hesitate, if you're experiencing a leaky basement give us a call today. Fixing the problem is more important and easier than you think! When your home was built, its foundation was laid in a huge hole dug in the ground. After the foundation cured and the basement walls were built up on top of it, sealant was applied to the exterior of the walls, and then the soil was replaced between the walls and the edge of the hole. This replaced soil, sometimes referred to as "back filled" soil, is a whole lot looser than regular soil and absorbs far more moisture. The increased absorption ability of the soil around your home means that during rainy or snowy seasons, your house becomes sheathed in waterlogged dirt and mud. This is a normal process, and often the original sealant placed on the exterior of your basement is sufficient to keep your home dry. Sometimes, though, that sealant breaks down or fails over time and the water that pools around your home starts to get in. There are other factors that can increase the pressure on your basement sealant like the grade of your lawn or the amount of sun and air your soil gets to help it dry out. Regardless of why you have a wet basement, we know how to find the problem and get to the bottom of it. We're dedicated to giving you your basement back. What's bad about a wet basement? Water in your basement means more than just a musty, moldy odor, damaged stored goods and unusable space. Water damage can have extensive effects on your home, including degrading its structural soundness and even threatening your health and the health of your loved ones. Water in your basement evaporates into the air which increases the humidity of your home. The increased humidity allows your ceiling tiles, drywall, wooden fixtures and structural elements in your house to absorb water. This water absorption can mean rotting joists, buckling floor tiles, swelling, discolored ceiling tiles, crumbling drywall, and more. The increased growth of mold, mildew and fungus spores is very aggravating to people with existing respiratory problems like allergies or asthma, and can even cause sickness in healthy people such as upper respiratory tract infections. Luckily, fixing your basement is easier than you think. Give us a call today for a dry, warm basement!